All private Higher Secondary Schools across the country remained closed for the second consecutive day on Monday due to a two-day nationwide shut down of all private higher secondary schools enforced by All Nepal National Independent Students Union- Revolutionary (ANNISU-R). The newly formed student wing of CPN-Maoist announced the strike on Sunday demanding that foreign names of all private Higher secondary schools across the country should be replaced by Nepali one. The ANNISU-R strike has affected tens of thousands of students in more than 600 private higher secondary schools across the country. Meanwhile, students affiliated to ANNISU-R torched a school bus belonging to the Delhi Public School near the Seutipul in Dharan on Monday. According to Anuj Kumar Das, teacher of Delhi Public School, the school bus was set ablaze while it was bringing 65 students ranging from Nursery to XII from Itahari and Duhabi. 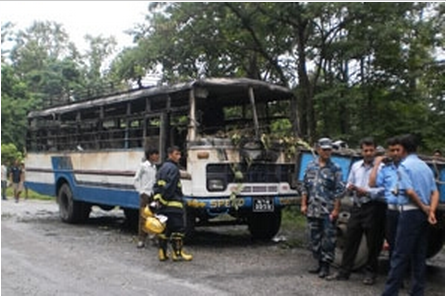 “A gang of around 15 cadres stopped the school bus and set it ablaze. The irate cadres have also vandalised the other school bus (Ko 1 Kha 450) while it was ferrying students from Dubahi,” said driver Reshamlal Urawa. Irate cadres had sprinkled petrol on the vehicle prior to the evacuation of the students, said 12th grader Ankit Sharma. Another school bus had, somehow, escaped vandalism. The bus has been completely damaged in the arson attack. Police said the assailants ran away after attacking the bus. This is a matter of agony that the students who protested against the trend of giving foreign names, shut over 600 colleges across the country and as part of it, they even set school bus ablaze. But, it’s a deep matter of concern that the ones who seems so much concerned over the names of colleges forget their ow identity. They were not spotted on Daura Surwal or Gunuo Cholo but they themselves were on a foreign dress i.e., jeans, jacket and what more to say ? Is name change really simple as they said ? Let say the names of the colleges are changed on their demand but will the future be as easy as it is now ? Let’s say a student lost is certificate which was of much value and he can’t move further without that certificate, then where shall he go. With the change in name the batch of students who have already passed through such colleges are much to suffer. Is this the correct time to bring such issues in place ? 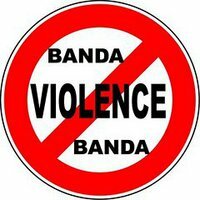 As we all know, Nepal is a under developed country, we need a life, we need to develop but this bandas without any good reason is a hindrance to the country and for it’s advancement. As this is a correct time for all of us to unite together to bring in new concept, a new beam of hope and to penetrate the darkness / poorness and to uplift the standard of all the underprivileged Nepalese. So, right from this moment, “SAY NO TO BANDA, AND LET’S MOVE ON A PATH OF BUILDING EVERGREEN, EVER BEAUTIFUL NEPAL”.